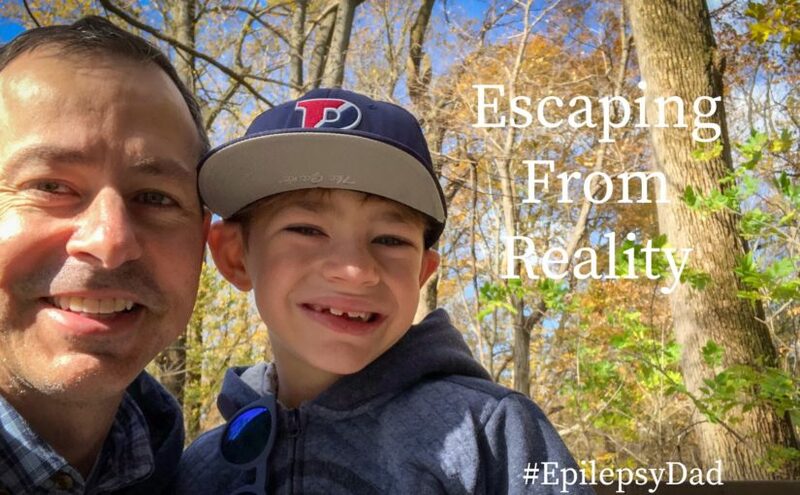 This post is part of the Epilepsy Blog Relay™ which will run from November 1 through November 30. Follow along and add comments to posts that inspire you! When I was young, I was always looking to escape. I could read a book and see the scenery described on the page around me. I would read Spider-Man comic books and imagine myself, the awkward outcast, swinging from web to web through my neighborhood. And I would get so immersed in a video game that I wouldn’t notice that I was hungry or tired or that the sun was starting to come up and that I had to get ready for school. My ability for my imagination to transform the world around me helped me escape from the inescapable situation that was my complicated childhood. My son has that same gift. When we play hockey in his room, I think he sees a sheet of ice, feels the cold air around him and hears the support from his teammates on the bench and the fans in the stands. When we play Avengers, I think he sees our apartment as the city in smoldering ruins and himself as Captain America defending the citizens against whichever villain he has me portraying. I’m grateful he has that. My son’s childhood is differently complicated than mine was. Where mine was lacking, my wife and I try to provide for my son in abundance. But the challenges that he is facing because of his epilepsy and the myriad of complications that come with his diagnosis is not something we can remedy. In his imagination, those complications don’t exist. A seizure doesn’t prevent the game-winning goal or take down The First Avenger. The side effects of medication don’t slow down the action or the hero’s mind. Those are things for the real world. Those are things to escape from. As someone who needed a place to go myself, I’m empathetic and want to encourage the behavior. As he gets older, he can evolve his ability to craft a world to wrap himself in to shape the real world around him. That world is likely to be sometimes hard, sometimes cruel, and sometimes dark. But imagination and creativity have a way of shining a light into the darkness and illuminating the way. However he chooses to use his gift as he grows up and whatever form it takes, I hope he dares to shine that light on the world. Because I’ve watched it grow inside of him and have seen how it already impacts those around him. And it’s glorious. NEXT UP: Be sure to check out the next post tomorrow by Glynn Partington at Living Well With Epilepsy for more on epilepsy awareness. For the full schedule of bloggers visit livingwellwithepilepsy.com. And don’t miss your chance to connect with bloggers on the #LivingWellChat on December 6 at Noon ET.